Durga Puja is the festival of Goddess Durga. Every year it comes in the month of October. This festival is beautifully held in the cities of Kolkata and Cuttack. 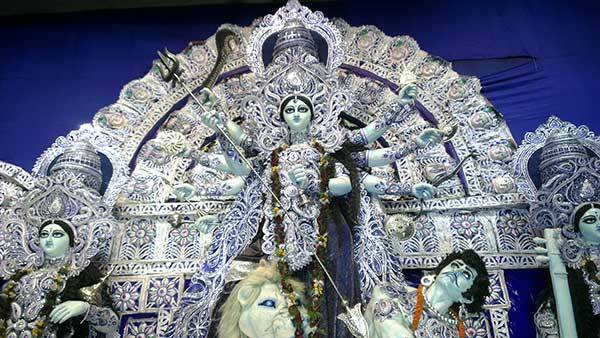 We have written the useful essay on Durga Puja, choose any one according to your requirement. 1. The Durga Puja is one of the most important and popular festivals in India. 2. Every year it falls in the month of September or October. 3. It was the day when Goddess Durga killed Mahishasura. 4. She symbolises the victory of good over evil. 5. During this festival school and colleges are remain closed. 6. People make idol images of Goddess Durga, Saraswati, Laxmi, Ganesh, Kartika. 7. They decorate puja pandals with different lights, flowers and clothes etc. 8. People wear new clothes and visit puja pandals with their families. 9. Next day people take the image of the Goddess Durga to the river for immersion. 10. Everybody enjoys the Puja a lot. Durga Puja is a significant festival of the Hindus. It comes off in the month of September or October. We have read from Ramayana about the great demon king Ravana. He Kidnapped Ram’s wife Site. Ram worshipped goddess Durga and received her blessings. Then he fought with Ravana and killed him. We observed it in great pomp and ceremony. The artists and the sculptors build the images of Durga with clay and straw. They create the Puja Pandals and decorate them with coloured papers and coloured clothes. We put on new dresses and eat sweet cakes and make merry. We carry the images to a river or a pond in a procession and immerse them in the water. We like this festival very much for the joy it brings to our homes. Durga Puja also is known as Durgotsav is one of the biggest festivals in India. In this festival Goddess, Durga is worshipped. Every year it comes in the month of September or October. Goddess Durga is shown in an idol with her two daughters Lakshmi and Saraswati. Lakshmi is the goddess of wealth and Saraswati is the goddess of knowledge. They stand on the right and left the side of the goddess Durga. She has two sons also Ganesh and Kartik. They sit side of Lakshmi and Saraswati respectively. Goddess Durga has ten arms. In each hand, she holds different weapons. She stands with her right foot is on a lion, and the left foot is on the Demon Mahishasura. His right arm caught by the lion. Goddess Durga has pierced the demon Mahishasura with her Trishul (spear). The Puja generally starts from the seventh day of the bright fortnight of abhinaya. The puja goes on for three days, on the fourth day which is called Vijay Dashami the idols are immersed in the water of the river, tanks, and ponds. Durga Puja is mostly celebrated in West Bengal, Orissa, Bihar, Jharkhand, Assam and Tripura. People place their earthen images on a pandal with Laxmi, Saraswati, Ganesh, Kartik and Lord Shiva. The pandals are beautifully decorated with different lights, colours, and clothes. During this occasion school, colleges and offices remain closed for a few days. Those who are working or studying away from their home. They come and meet their friends and families. It is a happy time for all. People wear new clothes and shoes and go out with their friends and families to visit many puja pandals. People forget their past enmity and embrace each other with affection and love. So, this festival brings a bundle of joy and amusement.